Maybe it wasn’t just the iceberg. Ever since the Titanic sank more than 104 years ago, killing more than 1,500 men, women and children, mystery has swirled around the tragedy. No one doubts that the ship collided at high speed with an iceberg off the coast of Newfoundland. But a new documentary posits that the sinking of the ship — hailed at the time as the largest ever built, and praised for its professed unsinkability — may have been accelerated by a giant coal fire in its hull that appeared to have started as long as three weeks before it set off on its fateful journey to New York from Southampton, England. In the documentary, which was broadcast on Channel 4 in Britain on New Year’s Day, Senan Molony, an Irish journalist who has spent more than 30 years researching the Titanic, contends that the fire, in a three-story-high bunker next to one of the ship’s boiler rooms, damaged its hull, helping to seal its fate long before it slammed into the iceberg. Mr. Molony’s potential breakthrough can be traced to an attic in Wiltshire, in southwest England, where a previously unpublished album of photographs chronicling the ship’s construction and the preparations for its maiden voyage had been gathering dust for more than a century. . . I sure hope that such (human) mistakes are not made as we collaboratively and competitively work frantically toward improved AI. And AI can help: I would think that AI, in reviewing the complete history of the technology, hardware and software and mathematical descriptions, could (from its pattern recognition/construction) find the most fruitful avenues of exploration and next steps, scaling upward. Heck, probably someone’s already working on that, just to see what would result. What’s the worst that could happen? From Jason Kottke, who explains in this post. The problem is the “fastest route” map doesn’t show the drop in elevation, and big semi rigs can slow down because the grade is too step. Read the report: something very bad soon will happen. It’s a serious bug in the technology. Remember when the Democrats passed ObamaCare through reconciliation, using procedural gimmickry to pass major social legislation over the unanimous objection of the majority party? So do congressional Republicans, and it looks like payback might be imminent. I know this is an easy mistake to make, but I’m pretty sure Obamacare was passed over the unanimous objection of the minority party, the Democrats having won a massive, landslide victory in 2008. They figured this gave them a mandate to carry out the promises made during the campaign—silly, I know, since only Republicans have mandates—and they proceeded to do just that. Less excusable is French’s contention that Obamacare was passed via reconciliation. It wasn’t. It was passed in the Senate under regular order, by a vote of 60-39 on December 24, 2009. Later, after Democrats lost their supermajority in the Senate, the House passed the Senate bill and then passed a second bill that implemented a few modest increases to subsidy levels and taxes. None of them were critical to the overall bill, but the Senate agreed to support these changes. These small, nonessential adjustments are the only part of Obamacare that was passed via reconciliation. Everything else—the individual mandate, the pre-existing conditions ban, the subsidies, the Medicaid expansion, the medical loss ratios, the donut hole, the cost improvements, the taxes to pay for it all—in other words, everything that mattered, was passed via regular order. As for the unanimous opposition of Republicans, that’s perfectly true. Democrats in the Senate tried mightily to put together a plan that might attract some GOP votes, but Republicans were adamantine. They pretended to negotiate, but by October it was clear they were just playing delaying games and had no intention of ever supporting anything that would expand access to health care. This strategy of blind obstruction, which applied to every part of Obama’s agenda, not just Obamacare, is a huge blot not on Democrats, but on the congressional Republicans who decided on it before Obama ever set foot in the Oval Office. It was only in the face of this unconditional obstruction that Democrats went ahead and passed something on their own. Jennifer Rubin this morning slammed Obama for “not cooperating with Republicans.” She has a short memory. That’s why she’s a conservative. By folding fractals into 3-D objects, a mathematical duo hopes to gain new insight into simple equations. The 3-D shapes that they build look strange, with broad plains, subtle bends and a zigzag seam that hints at how the objects were formed. DeMarco and Lindsey introduce the shapes in a forthcoming paper in the Arnold Mathematical Journal, a new publication from the Institute for Mathematical Sciences at Stony Brook University. The paper presents what little is known about the objects, such as how they’re constructed and the measurements of their curvature. DeMarco and Lindsey also explain what they believe is a promising new method of inquiry: Using the shapes built from polynomial equations, they hope to come to understand more about the underlying equations — which is what mathematicians really care about. In mathematics, several motivating factors can spur new research. One is the quest to solve an open problem, such as the Riemann hypothesis. Another is the desire to build mathematical tools that can be used to do something else. A third — the one behind DeMarco and Lindsey’s work — is the equivalent of finding an unidentified species in the wild: One just wants to understand what it is. “These are fascinating and beautiful things that arise very naturally in our subject and should be understood!” DeMarco said by email, referring to the shapes. “It’s sort of been in the air for a couple of decades, but they’re the first people to try to do something with it,” said Curtis McMullen, a mathematician at Harvard University who won the Fields Medal, math’s highest honor, in 1988. McMullen and DeMarco started talking about these shapes in the early 2000s, while she was doing graduate work with him at Harvard. DeMarco then went off to do pioneering work applying techniques from dynamical systems to questions in number theory, for which she will receive the Satter Prize — awarded to a leading female researcher — from the American Mathematical Society on January 5. To get a 3-D shape from an ordinary polynomial takes a little doing. The first step is to run the polynomial dynamically — that is, to iterate it by feeding each output back into the polynomial as the next input. One of two things will happen: either the values will grow infinitely in size, or they’ll settle into a stable, bounded pattern. To keep track of which starting values lead to which of those two outcomes, mathematicians construct the Julia set of a polynomial. The Julia set is the boundary between starting values that go off to infinity and values that remain bounded below a given value. This boundary line — which differs for every polynomial — can be plotted on the complex plane, where it assumes all manner of highly intricate, swirling, symmetric fractal designs. “The Julia set is the base, like the southern hemisphere, and the cap is like the top half,” DeMarco said. 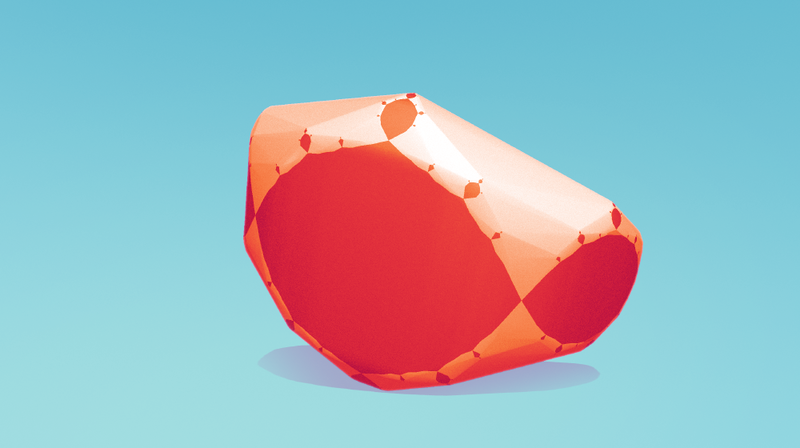 “If you glue them together you get a shape that’s polyhedral.” . . .
Continue reading. More at the link, including a good sidebar on the Julia set.
. . . “With all that Congress has to work on, do they really have to make the weakening of the Independent Ethics Watchdog, as unfair as it,” Trump began, continuing in a second tweet, “may be, their number one act and priority. Focus on tax reform, healthcare and so many other things of far greater importance! ‪#DTS.” “DTS” stands for “Drain the swamp,” one of the companion chants to “Lock her up!” during the Presidential campaign. It hasn’t been looking all that drained. What’s most telling about Trump’s tweet, and the possible source of the congressmen’s confusion, is that Trump is not objecting to the idea of “weakening” the watchdogs; he is just annoyed that the congressional Republicans are doing it on what he considers to be his time. They don’t have their priorities straight. This is not an office that would ever go after him, so why are they wasting his political capital crippling it? In the world as seen from Trump Tower, that’s practically political embezzlement. . .
. . . One mystery of all this is how the Republicans could have been so foolish—so conspicuous—given the populist rhetoric they themselves benefitted from in the past election. But when politicians become too used to saying things that they don’t believe, it becomes easy for them to forget that members of the public might actually be dismayed. And if they thought that Trump would cover for them, and help make them look good, the picture is that much more pathetic. (Chris Christie, now slumping in his office in Trenton, seems to have believed that, too.) Maybe, looking at the way business is done in the Tower, the congressional Republicans imagined that they might have a role like that ascribed to Trump’s adult children, seeking out the projects they liked and then bringing them to him for a wave of the hand. They may have thought that, when they smiled at his speeches, they’d shimmer a little, like Ivanka. Or maybe they thought that they’d be like his foreign partners, paying a modest fee to license the Trump name, using it to bring the locals into the golf course and keeping the serious money for themselves. They appear to have been wrong. In this case, they were the low-level Atlantic City contractors, sending a bill to Manhattan for the electrical work, having eagerly helped to build something bankrupt, and not even getting paid. Donald Trump’s selection of Rick Perry to lead the Department of Energy has prompted many Democrats to question Perry’s qualifications for the position. While he governed a state rich in fossil fuels and wind energy, Perry has far less experience than President Obama’s two energy secretaries, both physicists, in the department’s primary work, such as tending the nuclear-weapons stockpile, handling nuclear waste and carrying out advanced scientific research. That’s not to mention, of course, that Perry four years ago called for doing away with the entire department. However, there’s one realm in which Perry will have plenty of preparation: doling out taxpayer money in the form of government grants to the energy industry. What often gets lost in all the talk of the Texas job boom under Perry is how much economic development strategy was driven by direct subsidies to employers who promised to relocate to the state or create jobs there. Of course, many states have for years engaged in the game of luring companies with tax incentives. But by the count of a 2012 New York Times investigation, Texas under Perry vaulted to the top, giving out $19 billion in incentives per year, more than any other state. Perry’s economic development largesse came in many forms, but among the most high-profile were two big pots of money that he created while in office. In 2003, he founded the Texas Enterprise Fund, which he pitched as a way to help him close the deal in bidding wars for large employers thinking of moving to the state. Over the course of Perry’s tenure, which ended in early 2015, the fund gave out more than $500 million. In 2005, Perry created the Emerging Technology Fund, which was intended for start-ups. It gave out $400 million before being shuttered last year by his Republican successor, Greg Abbott. Disbursements from both funds were controlled by Perry, the lieutenant governor and the speaker of the House. The technology fund had a 17-member advisory board, all appointed by Perry. With such scant oversight, it did not take long for political favoritism and cronyism to creep into the programs. In 2010, the Texas Observer reported that 20 of the 55 Enterprise Fund grant recipients up to that point had contributed directly to Perry’s campaign or the Republican Governor’s Association, of which he became chairman in 2010. Also in 2010, the The Dallas Morning News reported that some $16 million from the Emerging Technology Fund had gone to firms backed by major donors to Perry. For instance, after Joe Sanderson received a $500,000 Enterprise Fund grant to build a poultry plant in Waco in 2006, he gave Perry $25,000. And the Emerging Technology Fund gave $4.75 million to two firms backed by James Leininger, a hospital-bed manufacturer and school-voucher proponent who had helped arrange a last-minute $1.1 million loan to Perry in his successful 1998 run for lieutenant governor and contributed $239,000 to his campaigns over the ensuing decade. This being Texas, it was not surprising that many of the leading beneficiaries of the taxpayer funds were in the energy industry. Citgo got $5 million from the Enterprise Fund when it moved to the state from Tulsa in 2004, even though it made clear that it had strategic reasons to move there regardless of the incentive. Chevron got $12 million in 2013 after agreeing to build a 50-story office tower in downtown Houston — a building that three years later remained unbuilt. Most revealing of the problems associated with the Perry model of taxpayer-funded economic development, though, may have been a $30 million grant in 2004 to a lesser-known outfit called the Texas Energy Center. The center was created in 2003 to be a public-private consortium for research and innovation in so-called clean-coal technology, deep-sea drilling, and other areas. Not coincidentally, it was located in the suburban Houston district of Rep. Tom DeLay, the powerful House Republican, who, it was envisioned, would steer billions in federal funding to the center, with the help of Washington lobbyists hired by the Perry administration, including DeLay’s former chief of staff, Drew Maloney. But the federal windfall didn’t come through, and the Enterprise Fund grant was cut to $3.6 million, which was to be used as incentives for energy firms in the area. Perry made the award official with a 2004 visit to the Sugar Land office of the Greater Fort Bend Economic Development Council, one of the consortium’s members, housed inside the glass tower of the Fluor Corporation. In 2013, when I visited Sugar Land for an article on Perry’s economic development approach, his administration still listed the Texas Energy Center as a going concern that had nearly reached its target of 1,500 jobs and resulted in $20 million in capital investment. There was just one problem: There was no Texas Energy Center to be found. Here, from the 2013 article in The New Republic, is what I discovered: . . .